Hino Australia will showcase examples of its 300 Series 4×4 as the main feature of its stand at the 2018 Australasian Fire and Emergency Service Authorities Council (AFAC) exhibition in Perth on 5th-8th September. A 300 Series 4×4 Crew Cab with a mine rescue and fire body which demonstrates the operational versatility of the light duty off-roader will be joined on the stand by a 300 Series 4×4 Crew Cab fitted with an Allison automatic transmission. The Hino 300 Series 4×4 is available in single cab and crew cab configurations, and is powered by a 165hp (121kW), 464Nm, 4 litre diesel engine mated to a six-speed manual overdrive transmission and a dual range 4×4 transfer case. The Hino 300 Series 4×4 is the safest Japanese-built truck in its class, and is the only 7,500kg Gross Vehicle Mass (GVM) 4×4 truck in Australia with Vehicle Stability Control, driver and passenger SRS airbags, cruise control, 4-wheel-disc-brakes and reverse camera as standard features. On display will be a crew cab on which Hino has worked collaboratively with Allison Transmissions and Penske Power Systems to design and engineer a true automatic transmission solution. 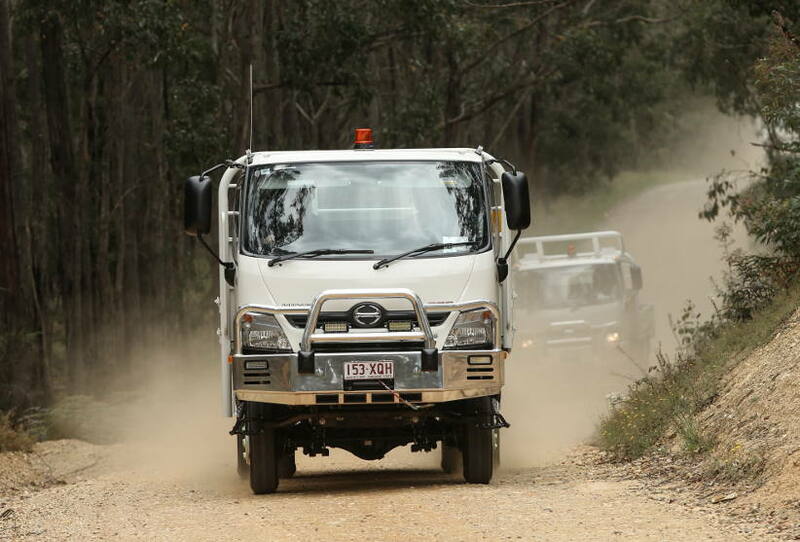 “There are customer applications that require a true automatic transmission option, which led us to engineer a local solution which could easily be installed into the Hino 300 Series 4×4,” said Daniel Petrovski, Manager, Product Strategy for Hino Australia. The transmission is an Allison 1000 series five-speed automatic transmission and features both ‘power’ and ‘economy’ shift programming. Gear selection is carried out via a Hino 300 Series automatic transmission gear position selector, so that anyone familiar with a car’s automatic transmission will feel at home in the Hino 300 Series 4×4 automatic. Its shift quality is seamless, while the activation of the truck’s exhaust brake initiates a downshift programme that keeps engine revs high, providing increased retardation on and off road. “Importantly, this local option is a true automatic transmission, meaning that the driver only needs to select the drive position and let the transmission carry out the gear selections and shifting no matter the terrain or transfer case range selected. “Given the often challenging conditions in which the 300 Series 4×4 automatic will have to operate, we wanted to deliver a solution that made the right gear-selection decisions for the driver, leaving them to concentrate on safely traversing the terrain,” Petrovski explained. “Not having to give thought to the transmission operation once drive is selected is a factor that will further broaden the appeal of the truck. “Showing the 300 Series 4×4 automatic at the AFAC in Perth gives the opportunity for our fire and rescue customers to see the quality of the local conversion first hand. “We have sold a significant number of the 300 Series 4×4 into the WA market already, and there’s now a number of additional orders with the automatic conversion – we anticipate generating further interest at AFAC,” he continued. The other vehicle on display features a mine rescue body fitted by Paull and Warner Body Builders, one of Australia’s premier suppliers of Emergency Response vehicles, which will be of particular interest to mine sites throughout Australia and abroad that operate their own Emergency Response team. “It is a multi-purpose appliance that is set up to not only fight fires but also to house the required tools to perform road crash rescue, first aid, hazmat and other general mine site based hazards,” said Petrovski. “This truck is fitted with fixed gas detection enabling the first responders to be able to size up an incident and understand potential unseen hazards prior to leaving the cab of the truck and a powerful lighting setup that makes this truck a great incident control base. “Capacity wise, the truck is fitted with a 1500L water tank and has storage for 40L worth of foam,” he concluded. The Hino 300 Series 4×4 is available from Hino Australia’s extensive network of dealerships and comes with a 3 year/100,000km warranty (whichever occurs first). Will SG Fleet buy Eclipx Group?